Things are definitely beginning to hot up, well, warm up at least. Tuesday saw the mercury rise up to 18oC in some places and my friends started to tweet (you can find me on twitter @Suffolk Nature) that they had seen their first butterflies of the year. Brimstone's, Small Tortoiseshell's and Red Admirals were all spotted, but not by me unfortunately. I was stuck at work in smokey old London town where the biodiversity was extremely limited to say the least. 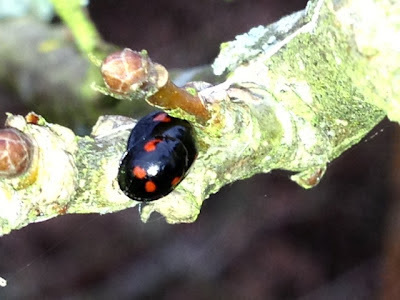 Then the Father-in-law sent me a picture of what he thought was a strange and possibly problematic Ladybird in his back garden. This turned out to be a harmless Pine Ladybird, one of our smallest (3 - 4.5mm) and also one of the first to wake from its winter sleep. It wasn't the first I heard about these, my good friend Matt had already told me the weekend before that he'd spotted some, so I knew where to go searching and when I finished work, that's what I did. It didn't take me too long to find them either, there were already a lot of 7-Spot Ladybirds out and when I spotted some of these on a small oak, I quickly found the Pine's nearby. A pair of Pine Ladybirds doing what comes natural. These coupled with my first Honeybee of the year, seen with pollen laden legs feeding on gorse, gave me two more species for the list. But it didn't end there, oh no. All this lovely warm sunny weather and talk of butterflies and all inspired me to get home and prepare the moth trap for its first all night session! Yes, I had extended the previously too short lead (Spring is here!) with the appropriate wire, long enough so I didn't need the un-weather proof extension lead. I'll show them butterfly spotters I thought and show them I did. Getting up an extra hour in the morning before work gave me enough time to empty and survey my trappings! 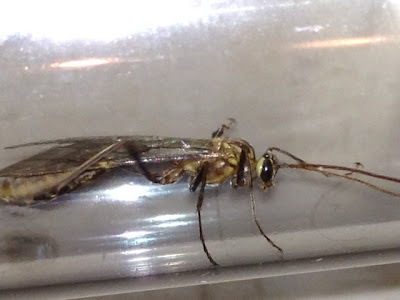 The first out was not a moth but a rather large Ichneumon wasp, these are a type of parasitic wasp that lay their eggs on the developing larvae of moths and butterflies. The eggs then hatch and basically devour their host from the inside leaving the important organs till last so that their victim is alive for the most part. Nice, NOT. But hey, these are a gardeners best friend and help to stop hungry caterpillars from devouring plants. Ichneumon wasp. I love the head on this. This was followed by a plume moth that doesn't have a common name although it's a fairly common moth, Amblyptilia acanthadactyla. Unfortunately, and for the life of me I don't know why, I didn't take any pictures of the said moth. 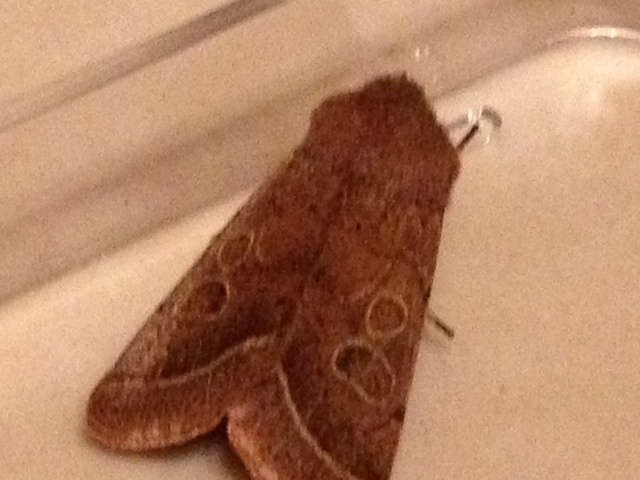 I'll make a note of this and next time you will see how they differ from the other moths. The other moths were five macros and a micro. The difference between these two are wing length, a macro's wing is 1cm and greater along the leading edge and a micro <1cm, simples. 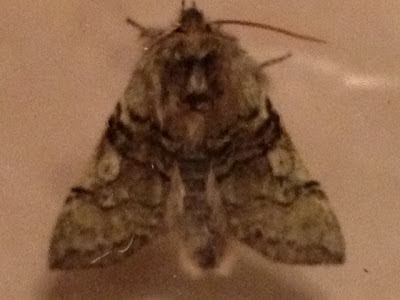 So the macros were a Spring Usher (Agriopis leucophaearia), Small Brindled Beauty (Apocheima hispidaria), Common Quaker (Orthosia cerasi), Yellow Horned (Achlya flavicornis galbanus) and Dotted Border (Agriopis marginaria). 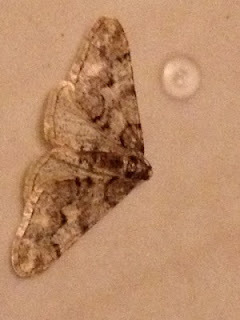 The last one incidentally wasn't in the trap but appeared on the patio door as I got ready for work, as if to say, 'Don't forget about meeee!'. The others took some time to identify (except for the first two which I had already caught before) and with some help from some of my new found friends on Twitter they helped me to ID the Yellow Horned and the micro, which turned out to be Alceris cristana and the same moth that I had found earlier in the week, but in a different colour form. Sorry for the poor picture quality, I took these with my camera phone not long after waking up and it is obvious that this sort of photo shows the quality of my vision at 4am. I promise to bring you much better, higher quality photos in future. You read it here folks! in the week, shown below. 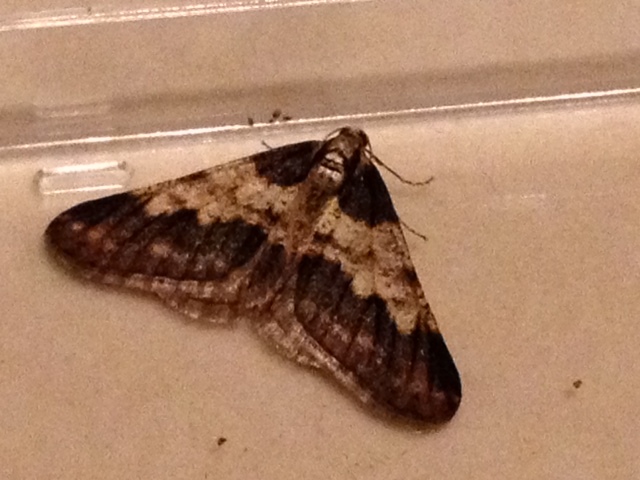 So, with the warmer weather approaching it would seem the moth trap will be beneficial to my needs. I even put it out again last night, but this time I didn't have so much success with only three moths caught this time and two of them had been caught before. But the new one, which really was hard to ID was the Small Quaker O cruda. So here's the list and you'll notice that the birds are now giving way to the invertebrates.